Discouraged? Think you don't matter? A friend is serving in Iraq as a chaplain. He just sent an update - the first since he got to come home to sw MO for a two week R&R break. He's nearing the end of his 15 month deployment (another ministry acquaintance just landed in Iraq for the start of his deployment as a chaplain). Anyway, several things jumped out of Gary's update....I thought I'd share them with the bloggy world. It helps me remember, that outside of my little world in NW Ark, there's a lot of things going on. It's a reminder that we need to pray for our service men and women - regardless of your personal feelings of the war. We need to pray for the families of those serving on the front lines. We also need to pray for the Iraqi people. It's been a long war. Dear God, let there be an end soon for everyone. I’m excited that there is another soldier awaiting baptism (that’s 4!) and knowing that conversations I had along the way have made a difference is very gratifying. The impact of deployments is tremendously hard on families… to the point that nearly one out of three of our younger married soldiers considers or intends to divorce or separate upon their return home from theater (according to the latest mental health study)-- plenty yet to do! The deployment will end, but the ministry will carry forward for many months after we are home. On Friday, I was leaving the church office with my camera, and an elusive robin that I've been trying to take a picture of, was boppin around the courtyard. It wasn't just "hoppin'" around the grass...it was chasing a worm. 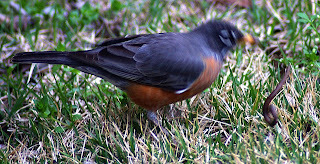 The picture's not "perfect" but you can see the robin's head, going for the worm, and it's flying thru the air. It made me realize that I might have missed this little serendipity moment, if I had kept focused and headed to my meeting - with binders on. How often, I miss the small things, because I can't see the trees in the forest.